Mian Situ Handsigned and Numbered Limited Edition Giclée Canvas:"Twilight Crossing"
Edition Size: Artist Signed and Numbered Limited edition to 50 canvas editions. COA included. Medium: Fine Art Giclee on Canvas. About the Art: Born in Southern China, Mian Situ received his formal art training in his native homeland of Guangdong, formerly Canton. He graduated with a Bachelor of Fine Arts from the prestigious Guangzhou Institute of Fine Art. After instructing for six years, he earned a Masters in Fine Art. Immigrating to Canada, then later moving to the United States, Mian's paintings clearly reflect his upbringing in the rural countryside of his native China. 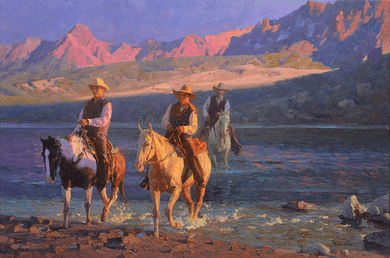 His artistic diversification of subject matter, from the people of the small villages and farming communities going about their daily lives to the exquisite portraitures as well as his most recent works inspired by western historical themes and American landscapes, all reflect the sensitive dedication of this Master Artist. Mian has been recognized with many national art awards. During the 2002 Masters of the American West exhibition and sale at the Autry National Center in Los Angeles California, Mian Situ received the Masters of the American West Museum Purchase Award, the Thomas Moran Memorial Award for Artistic Merit and the Patron's Choice Award. In 2003, Mian was honored with the Thomas Moran Memorial Award, Artist's Choice Award and Patron's Choice Award. Most recently, in 2005, Mian was presented with the Artist's Choice Award for his painting, The Word of God. Mian Situ is represented by Trailside Galleries in Scottsdale, Arizona and Jackson, Wyoming. He lives with his wife, Helen and daughter, Lisa in Southern California.